Abundant and beautiful, many (including me) pass up using it year to year because we don't know what to do with it. Here are two GAPS-friendly, honey-sweetened, nourishing recipes to help you use it up — a tart rhubarb jam and moist rhubarb-walnut muffins. Tart and refreshing, you'll pucker up and smile while eating this jam! Makes 1 pint. Put water and rhubarb in a saucepan. Bring water to a boil, cover pot, and let steam for about 5 minutes, or until rhubarb falls apart. Turn off heat. Add calcium water to rhubarb and mix. In a separate bowl or cup, mix together honey and pectin. Turn on heat again. Add honey mixture to rhubarb and mix in well while coming to a boil. When it boils, remove from heat. Pour into a clean pint size jar. Cover and refrigerate jar. Will set up in refrigerator. Can be frozen as well. This recipe can be scaled up easily. 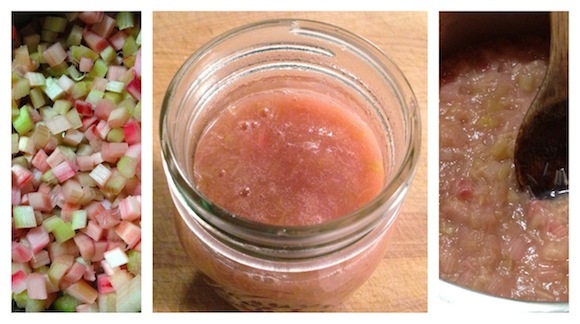 For GAPS: Omit pectin and simmer cooked rhubarb with honey for a minute or two. It will thicken up when chilled, though not as thick as with pectin. *Pomona's Pectin is a wonderful, natural pectin that doesn't depend on having a certain amount of sugar or even a certain type of sugar for setting up. You can use no sugar, low sugar, or natural sweeteners such as honey or stevia! It is versatile and easy to use. Click here for Pomona's free PDF of recipes and instructions — very handy, easy to read, and a breeze to implement! We're on the GAPS diet right now. Being able to make muffins out of blanched almond flour is saving us from craving things we shouldn't be eating. We really love them. I make a few variations, and they always turn out moist and cakey inside, and crispy crunchy on the outside. My latest variation, this rhubarb-walnut, carries only a hint of rhubarb (in case you're afraid someone won't like them). Actually, the rhubarb is quite nondescript, and could be increased if you desire. If you omit the baking soda, they won't rise as much and be a bit more dense, but they're still really, really good. Yields 12 muffins. Preheat oven to 350 degrees Fahrenheit. Steam rhubarb in water until it falls apart. Set aside to cool. Blend together eggs, honey, salt, cinnamon, vanilla, butter or oil, and almond flour. Mix in rhubarb and walnuts. Add baking soda (it will probably foam up due to reacting with the acid in the rhubarb). Scoop by 1/4 cup full into paper-lined muffin tins. Bake for 25 minutes or until toothpick inserted comes out clean. Use bottom rack of oven, as almond flour browns quickly when too close to the top of oven. Serve with butter or jam. Store in an airtight container at room temperature for up to 5 days. These freeze well. This post is shared in today's Seasonal Recipe Round-Up featuring rhubarb and also with Pennywise Platter Thursday and Fight Back Friday. These look so good and I have some rhubarb ready to be harvested from our garden. cup sugar. Do you just replace 1 C sugar with `1 C honey? Thanks. For one gallon of Kombucha, I do the tea in a few cups of water, then I dilute with cold water to fill the brewing jar. I use 3/4 cup honey (it is sweeter than sugar). 6 tea bags. Kellan — It is part of the Pomona’s Pectin package. The box contains two packets — a little packet of powder that you stir in to water to make calcium water, and another packet of pectin. The calcium activates the pectin to gel, independently of how much sweetener (or not) you add. these look really good Wardee. I do not think that pectin is GAPS-legal however. I don’t know if there is a difference with the one you posted or not. Do you think it would work without it – or maybe in conjunction with some berries? Oh, I forgot to add that! I wasn’t sure if this pectin was GAPS-legal or not (and obviously we are breaking it with this batch, if so). I thought it very well could be because it is derived from fruit. If not, or if someone wanted to avoid it entirely, I would suggest omitting the pectin and calcium water and simmering the cooked rhubarb for a minute or two with the honey so it will thicken up on its own. It would not be quite as thick, but still super, I think. My online searches are not turning up anything definite, though I see that Heather from Mommypotamus uses Pomona’s in her GAPS jam. I left a comment to see if she knows for sure that Pomona’s is okay. Heather just let me know that all pectin is out, Pomona’s includeed. 🙂 So just use the simmering method. I updated the post to note this. Hi Wardee, on the following list it is listed as an “avoid food”. http://gapsdiet.com/The_Diet.html. I think this is an official GAPS site run by Dr. NCM. I am not sure what it is about it that is not okay but I have just never used it. But I’m glad to hear you think it would still work without it. I will have to try it. Thanks for the recipe! If I use coconut flour instead of almond flour, what alterations to the recipe would you suggest? An extra egg? Tara — Coconut flour is a different beast. You can’t just substitute it and I’m afraid I’m not very experienced in converting recipes to coconut flour. I’d suggest finding a coconut flour-based muffin recipe that calls for applesauce or something similar to cooked rhubarb so you can tweak that. Dona — Yes, you could. I think you might need a little less. Go slowly adding the flour until you get a good muffin batter consistency. I would mix the rhubarb into the egg-honey mixture first before adding flour. Thanks Wardee. I made these yesterday. I used sprouted WW flour. I definitely used less flour, only 2 cups of flour and that was almost too much. The muffins were good but a little dense. 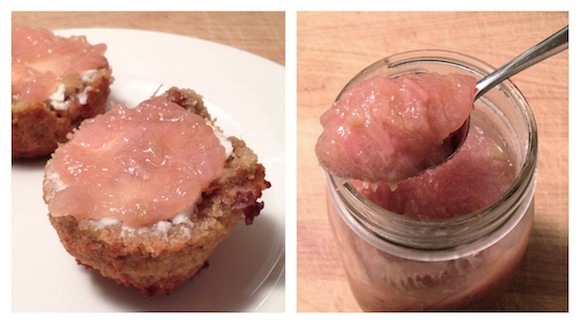 Also, my DH wanted more rhubarb in the muffin next time. I found some almond flour at Whole Foods yesterday, so next time I make them I will use that flour. I did notice that the flour costs more than sprouted so I will bake sparingly with it. I had no idea you were on the GAPS diet. I’d love to hear more about why you’re doing it, your experience so far, etc. Thank you so much for sharing this Wardee! Living in Alaska, we always seem to have more rhubarb than I know what to do with (it grows well here!). We are also in the middle of our second round of the GAPS diet (though quite modified), so it’s great to have something new to add to our meals! Blessings to you and your family! These look really good! I haven’t ever made anything with rhubarb, but have wanted to give it a try. Any tips as far as peeling the stalks for the uninitiated? Is it pretty clear how much to peel when you get some? I’m also glad these work for GAPS! I didn’t realize you guys were doing GAPS, but I’m glad for any recipes you share. I’ve been meaning to make some muffins again lately. It’s been a while since I’ve made any. Mindy, it peels really easy. Use a paring knife to get the outer layer away at the top of the stalk and then just your fingers to pull it off all the way down. The “peel” (not really a peel but the thin and stringy part) is usually the more colorful part. Thanks for the explanation, Wardee! I’ll have to look for some rhubarb this week to try it out. I’m not on GAPS, could I substitute wheat flour for the almond flour? Evelyn — I’d suggest adding cooked rhubarb to the sourdough muffin recipe in the Sourdough eCourse or Sourdough A to Z eBook. Hi, I I’m wondering if unsprouted almond flour would have the same affect as unsprouted wheat flour?